Imagine – you are on a long, stress-free vacation, spending time in a rich, wonderful city. Needless to say, you would want to enjoy every bit of your time there. After all, who likes to put in their hard-earned money on a trip, go through the TSA to get on an overbooked flight, and reach their destination only to get bored? No one! So, we will give your suggestions on what you should do to get the most out of your vacation? Obviously, you will go sightseeing, but we also suggest you try adventure sports, visit national parks, take a long stroll on the local streets, enjoy exquisite food, and last but not the least you’ll want to go shopping! Being on a vacation and not buying a souvenir is like having a delicious, wholesome dinner without getting to eat dessert. All the shopping lovers out there would totally agree with our point of view. If you happen love shopping then you would know how therapeutic it is to bring back gifts for your family and friends. The euphoria one feels while buying something special during their vacation is priceless. Plus, shopping while traveling helps you collect souvenirs which serve as a beautiful memory of the fun times you had during your travel. Let’s admit it when you return back home after a vacation, your family and friends expect gifts. Therefore, cool souvenirs can be a way to show love and devotion to your everyone waiting at home for your safe return. We now know that your next vacation wouldn’t be complete without some shopping therapy. 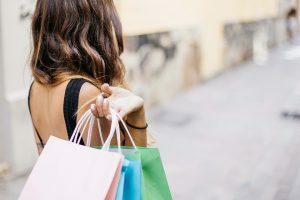 But among so many cities in the world, choosing a destination that also offers great shopping opportunities is not an easy task. Don’t worry, if you are looking for a sunny beach vacation with plenty of shopping we would suggest you take a trip to St. Armand’s Key – a breathtaking island in Sarasota Bay, Florida. Fun fact: The Island is named after a Frenchman Charles St. Amand who bought the lsland which is 131,189 acres on the key in 1893 for whopping $21.71. The place is the main attraction for shoppers and diners belonging to all walks of life. The island contains almost 130 businesses which include fashionable boutiques, lovely restaurants, interesting shops, famous galleries, classy salons, and lots more! Shopping lovers will be glad to discover a wide array of options on this happy island. Where are some of the can’t miss stores for you and your family, keep reading we have some recommendations. Art lovers when on a vacation in St. Armand’s Key must visit the incredible galleries such as Giving Tree Gallery, The Stadium Gallery, Wall Art, or The Wyland Galleries. Each of the galleries has something unique to offer to its shoppers. Giving Tree Gallery is a modern family-owned gallery that features a vast range of dainty jewelry and home décor. If you want to buy any of these two items, you must visit this place. Art lovers with a knack for photography should go to The Stadium Gallery while those who want to buy quality artwork must consider a visit to The Wyland Galleries. We wouldn’t be lying by saying that you can find many types of gift shops in St. Armand’s Key. If you are looking to buy excellent quality cooking supplies and yummy food ingredients, a visit to Florida Olive Oil – a private company would be time well spent. The original olive oils and different kinds of vinegar of this company are world famous. The real beauty of jewelry is in making a woman feel beautiful and attractive is undeniable. When in St. Armand’s Key, don’t forget to step into their popular jewelry shops. A few we enjoy include Armel Jewelers, Jewelry by Cole, Otto’s Jewelry Service, Sahra’s Treasures, and Simona Jewelry. Every one of these jewelry shops feature intricately designed jewelry that are absolute masterpieces. You will find all kinds of magnificent pieces ranging from simple, delicate ones to chunky, elaborate ones and everything else in between. For example, Armel Jewelers offers a fine jewelry collection along with gift-ware, tabletop décor, and fine silver. The jeweler uses only the best materials in diamonds and stones such as platinum and nickel-free gold. Jewelry by Cole boasts some of the most breathtaking gold jewelry. The jewelers specialize in redesigning of old jewelry. Hence, they give a new, classic touch to old pieces. Otto’s Jewelry Service is a master of European Handwork and custom design. Simona jewelry offers the smallest to the largest hand crafted designs which often means choosing just one piece won’t be easy. Bennington Tobacconist – a shop for excellent quality cigars, lighters, ashtrays, pipes, pipe tobacco etc. Le Macron French Pastries – a pastry shop that offers world’s best macaroons, croissants, and pastries. Tour de L’Afrique – a store that houses intricate hand-crafted items. St. Armand’s Key, indeed, is a haven for all shopping lovers and a perfect place for all foodies out there. Go and enjoy a good, long vacation. For a blissful St. Armand’s Key vacation, contact Jennette Properties today. They know how to make your visit to St. Armand’s Key the best one ever!